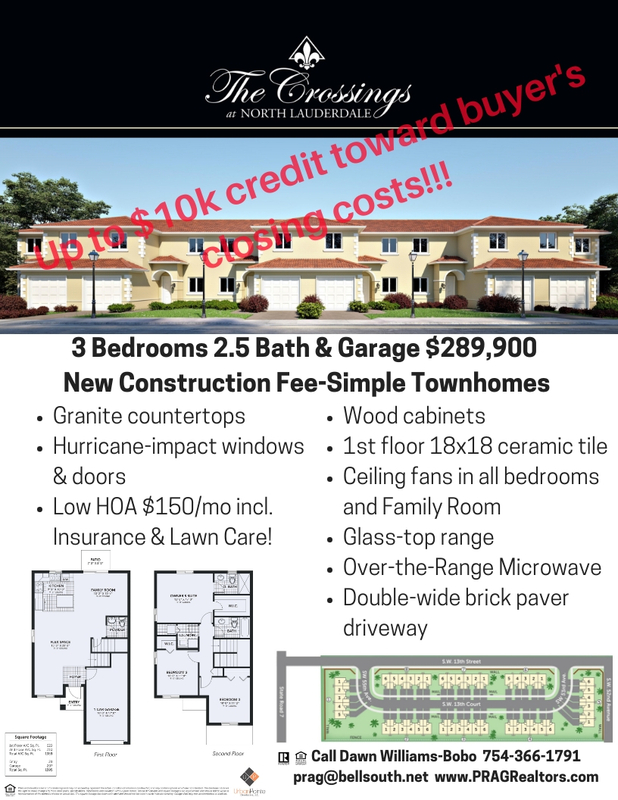 The Crossings at North Lauderdale NEW 3/2 Townhomes under $300K! PRAG Realtors is proudly featuring this brand new townhome community in the heart of Broward County. The Crossings at North Lauderdale is a quaint intimate community of only 46 brand new townhomes, strategically nestled just East of SR 7 in the progressive city of North Lauderdale. The Crossings is affordable luxury at its best! Minutes from South Florida’s most popular destinations, Granite countertops, wood cabinets, and hurricane-impact windows and doors are all standard. Low HOA. Up to $10,000 credit toward buyer closing costs when using our preferred lender! Are you a broker or agent with interested buyers? Click here to request an unbranded sales packet!